Physicians and medical scientists were the first who recognized the great dangers of a new type of weapon and 70 years ago alerted the world about its devastating effects. Very soon after the US atomic bombing of Hiroshima, representatives of the International Committee of the Red Cross (ICRC) in Japan informed the international community about the completely destroyed, though formerly prosperous, city. The ICRC—the world’s premier medical-humanitarian organization—first called for nuclear weapons to be banned in September 1945, one month after the atomic bombings of Hiroshima and Nagasaki. Red Cross doctors were among the first to witness the suffering in those two cities. Since that time, physicians and medical scientists have played a key role in investigations of the dangerous effects of nuclear weapons and other mass destruction weapons, warning governments and the public about the extreme danger of nuclear war. They have been on the front line of investigations to prove the immediate and long-term effects of nuclear weapon production and testing. They tried to unite all antinuclear forces, but it was not easy in the period of great tension between the superpowers. The promoting effect and point of crystallization was the Russell-Einstein Manifesto, which induced formation not only of the Pugwash movement, but also several NGOs in the main nuclear countries, including Physicians for Social Responsibility (PSR) in the USA and several NGOs in Russia, where medical scientists have played an important role. After the peaceful solution of the Cuban missile crisis, several years have seen more or less success in antinuclear events: the most important was 5 August 1963, when the Partial Test Ban Treaty (PTBT) — also known as the Limited Test Ban Treaty (LTBT) — was signed in Moscow by the United States, the Soviet Union, and the United Kingdom. The Treaty requires the Parties to prohibit, prevent, and abstain from carrying out nuclear weapons tests or any other nuclear explosions in the atmosphere, in outer space, under water, or in any other environment if such explosions cause radioactive debris to be present outside the territorial limits of the State that conducts an explosion; to refrain from causing, encouraging, or in any way participating in, the carrying out of any nuclear weapon test explosion, or any other nuclear explosion, anywhere which would take place in any of the above-described environments. A new Cold War period started in the late 1970s after the invasion of Soviet Army in Afganistan. Most dangerous was the concept of a first nuclear strike and the conclusion of the US administration about the possibility of winning a nuclear war. During the period of increased Cold War tension in the early 1980s, the medical community mobilized again to educate the public about the enormous threat to public health posed by the arms race. IPPNW was founded in 1980 by physicians from the United States and the former Soviet Union who shared a common commitment to the prevention of nuclear war between their two countries. Led by co-founders Drs. Bernard Lown, Jim Muller, Eric Chivian and Herb Abrams of the US and Drs. Evgueni Chazov, Mikhail Kuzin and Leonid Ilyin of the Soviet Union, they organized a team to conduct meticulous scientific research based on data collected by Japanese colleagues who had studied the effects of the atomic bombs dropped on Hiroshima and Nagasaki. And they drew upon their knowledge of the medical effects of burn, blast, and radiation injuries. IPPNW co-president Tilman Ruff has said in a recent interview, “As physicians, we have the privileges of scientific and medical understanding and we live well-resourced and comfortable lives full of opportunity. These bring ethical responsibilities and responsibilities to act.” Working in any area of public and global health requires collaboration and partnership. Citing the first principal of the medical profession—that doctors have an obligation to prevent what they cannot treat—a global federation of physician experts came together to explain the medical and scientific facts about nuclear war to policy makers and to the public, and to advocate for the elimination of nuclear weapons from the world’s arsenals. In its first five years, IPPNW, working closely with its US affiliate Physicians for Social Responsibility and with IPPNW-Russia, educated health professionals, political leaders, and the public about the medical and environmental consequences of nuclear warfare. Throughout the 1980s and the 1990s, IPPNW comprehensively documented the health and environmental effects of the production, testing, and use of nuclear weapons. In a series of well-researched, authoritative books and numerous articles and op-ed pieces in medical journals and the popular press, IPPNW spelled out the tremendous price nuclear-weapons states are paying in their pursuit of nuclear weaponry. From uranium mining to nuclear testing and production, from Nevada to Moruroa and Hanford to Chelyabinsk, IPPNW and its affiliates collected and analyzed data that provides the public with a frightening assessment of the health and environmental costs of pursuing security through nuclear weapons. IPPNW and its affiliates not only educated the public, they also organized citizens in the nuclear states to protest and change their governments’ policies. IPPNW believes that the active involvement of millions of people is essential if we are to prevent war and abolish nuclear weapons. Physician activists were instrumental in the campaigns to ban atmospheric and underground nuclear test explosions and in helping to shut down nuclear weapons testing sites and production facilities. IPPNW carried its antinuclear educational work around the world. Doctors met with Presidents Ronald Reagan and Mikhail Gorbachev to urge them to end the arms race that had brought the world to the brink of nuclear annihilation. Gorbachev described the effect his meetings with physicians had on his thinking about nuclear weapons when he was launching a series of initiatives, the first of which was his unprecedent declaration about unilateral cancelling of all nuclear testing. .
For this effort, which united physicians across the Cold War divide, IPPNW was awarded the UNESCO Peace Education Prize in 1984 and the Nobel Peace Prize in 1985 in recognition of the special role and responsibility in preventing nuclear war. Due to the efforts of and pressure from NGOs, the Comprehensive Test Ban Treaty (CTBT) was signed in 1996, but has still not been ratified by some nuclear countries, including the USA. IPPNW members made many investigations and publicized numerous articles about radioactive contamination in the South Urals, contamination of Russian territory after atmospheric nuclear tests, about the Chernobyl and Fukushima nuclear reactor disasters, their effects on health, etc. In the years since the end of the Cold War, after the dissolution of the Soviet Union, the medical community has paid far less attention to this issue. We, like most of the world, have acted as though the danger of nuclear war were a thing of the past. But it is very important to explain to decision makers and to the public that the greatest danger is posed by the arsenals of the countries that already have nuclear weapons—more than 15,000 nuclear warheads, and more than 2,000 that are on hair-trigger alert. The very real danger of accidental nuclear war remains. Five times since 1979, either Moscow or Washington prepared to launch nuclear weapons in the mistaken belief that it was already under attack by the other side. One of the new concepts in the basement of antinuclear activity became not only immediate devastation by heat, storms and radiation, but a revised understanding of nuclear winter and nuclear famine. If “only” 300 warheads were detonated in any big country, close to 100 million people would die from the blast and heat effects in the first half hour and the entire economic infrastructure would be destroyed. US physicians have calculated that if this were to happen in the USA, the public health system, the communications networks, the electric grid, the banking system, the food distribution system—all would be gone. In the subsequent months, the vast majority of Americans not killed in the initial attack would die from starvation, radiation sickness, epidemic disease, or exposure to the elements. A corresponding US attack would create the same devastation in Russia, and much of Europe would suffer the same. In November 2013, the Council of Delegates of the International Red Cross and Red Crescent Movement renewed its call for the elimination of nuclear weapons at the IFRC’s General Assembly in Sydney, Australia. The resolution, “Working towards the elimination of nuclear weapons,” was adopted unanimously. IPPNW physicians played a vital role in all three conferences on the Humanitarian Impact of Nuclear Weapons (HINW), which were the first ever intergovernmental conferences focused on the actual impacts of nuclear weapons and the essential evidence that needs to drive policy around them. Ira Helfand, Masao Tomonaga, Andy Haines and IPPNW science advisor Alan Robock made seminal contributions on the medical effects of nuclear weapons, radiation health affects, and the implications for the global climate and food supplies of nuclear war. The humanitarian conferences reinforced the conclusion that these effects are unequivocal and indisputable. More than 80% of the world’s governments, key UN agencies and international organizations, the Red Cross/Crescent movement, the large majority of experts and civil society organizations accept the evidence as it was presented. The Vienna HINW Conference produced the Humanitarian Pledge. More than 120 states have signed onto the Pledge so far, committing those governments to cooperate to fill the legal gap regarding nuclear weapons. The nuclear-armed states have failed to demonstrate any serious intent to fulfill their binding legal obligation to disarm; rather, they continue to squander the resources of current and future generations in massive investments clearly intended to modernize and maintain nuclear weapons for the long haul. The states without nuclear weapons can establish an unequivocal moral and political norm and legal embodiment that nuclear weapons must be eliminated before they are again used. Countries could also back up a nuclear weapons ban treaty with strong domestic legislation prohibiting anyone under their jurisdiction from contributing to nuclear weapons development, deployment, threat or use in any way. They could also prohibit individuals and institutions within their jurisdiction from investing in companies producing nuclear weapons. They could end the production of fissile materials, eliminate them wherever possible, and put the rest under strict international control. The abolition of nuclear weapons is the core mission of IPPNW. Citing the first principal of the medical profession—that doctors have an obligation to prevent what they cannot treat— IPPNW launched ICAN—the International Campaign to Abolish Nuclear Weapons—in 2007 and, with hundreds of civil society partner organizations, campaigns for a treaty to ban nuclear weapons, leading to their elimination. In 1998 and again in 2008, the World Medical Association condemned nuclear weapons and called on the governments of the world to work for their elimination. The World Medical Association adopted another such a resolution at its Moscow meeting in October. Since the destruction of Hiroshima and Nagasaki in August 1945, the medical and international relief communities have understood that there can be no meaningful response to the terrible devastation caused by nuclear weapons. All existing resources would be overwhelmed by the magnitude of the devastation. Based on this understanding, we have a responsibility to prevent what cannot be cured. Banning and eliminating nuclear weapons is the best and only way to prevent their use. Dr. Kolesnikov was Co-president of IPPNW from 1991-1999 and again from 2008-2012. A member of the Russian Pugwash Committee, he was also a co-president of the Parliamentarians for Nuclear Non-Proliferation and Disarmament from 2006-2011. 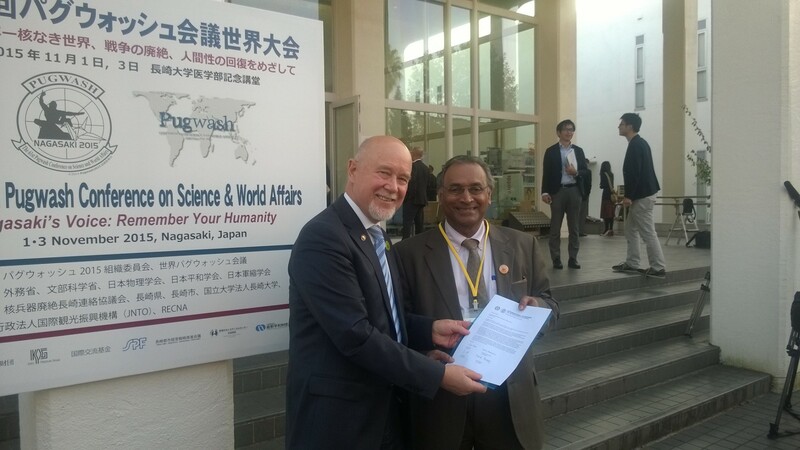 This guest commentary is adapted from a presentation to the 61st Pugwash Conference on Science and World Affairs, held recently in Nagasaki. Nuclear weapons cannot be used without disastrous consequences to the perpetrator as well as everyone else. We need to use every opportunity to spread this message to everyone: it is stupid as well as immoral to keep on high alert (“hair-trigger”) many more than enough nuclear weapons to destroy civilization if not all higher forms of life, as is now the case. The only rational course is the zero option: to ban and disassemble all nuclear weapons everywhere.